The Ice Co Storage are the warehousing division of Europe’s largest ice manufacturer and part of the J-Marr group. They are based across 3 sites in the UK and boost over 20, 000 pallets of storage capacity at their South Kirkby Branch alone. 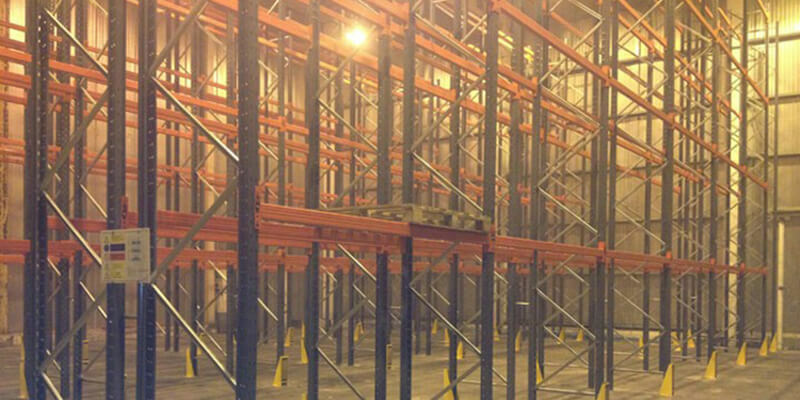 After assessing a few options we recommended a standard Adjustable Pallet Racking to suit their current reach trucks. We managed to cram an impressive 450 pallet locations in the small chamber to the delight of the client. We choose Ramada racking for this particular application which is Dexion Speedlock compatible. The client already had Dexion and Ramada onsite so we wanted to match in for ease of spares. As they were keen to protect their investment we installed column guards to all the aisle facing posts and tubular barriers to the run ends. We finished off the installation by installing SEMA recommended load notices showing the maximum permissible load per pair of beams along with the relevant bay loads. Once complete the project was dropped down to minus 28 degrees and loaded up.